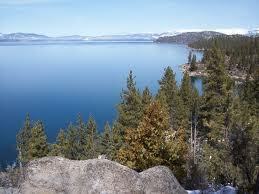 Ah, lovely Lake Tahoe. So much beauty so close to home. Craig and I have been coming here every year during the summer since the mid 1990's. We started out camping but when my then 18 month old dumped a bucket of ash from the extinguished fire down the front of her shirt, we decided to start staying in a house with running water and a bathtub. Since the summer of 2002, we have stayed in the gorgeous home of our friends David and Laura, who have generously allowed us to create family memories here year after year for a very very small fraction of what this luxury accommodation would cost the average family. The last few years schedules have dictated that we come in late June instead of mid-July, and both times we had to do this, we struggled with the weather. Last year for one day we sat huddled on the beach in long pants and sweatshirts, and not once during the entire week did we feel like getting into the chilly Tahoe waters. This year as we arrived there was no beachgoing, just rain and 59 degrees. Anyway, my mom is convinced that June is too early to come to Tahoe. Craig and I are not convinced. Both years the sun made its appearance later in the week and as part 2 of this posting will reveal, the weather this year ceased to be an issue, and full summer fun was had by this GoFamily in June of 2013. What a weird heading, but I just have to throw a huge shout out to promote this incredible place where we have stayed for 11 summers. The best way to see it is to just go online to Lake Tahoe Accomodations and just see the pictures and take the virtual tour. This house is 5 bedrooms and 3.5 bathrooms on three levels and is 2792 square feet. The master suite is on the top floor with the main living and dining area. The entry floor has three bedrooms and a bathroom as well as another living space with another flat screen TV. The bottom, or street level floor has bunk bed space for seven and another full bathroom. All linens are provided. All the bedrooms have ample closet and drawer space. All bedrooms but one have king size beds. There are 5 flat screen TV's throughout the house, including two with DVR type recording options. There is also free Wi-Fi. There are two wrap around decks, a gas grill, and a hot tub. The kitchen is by far the best equipped I have even encountered in a rental. You can park 5 cars at this rental. has been replaced, new televisions, new bedspreads, new sofas--the list continues. The latest renovation was a completely new paver driveway and new front landscaping. My hubby was particularly impressed by the brand new concrete footings supporting the deck! The only caveat is that luxury like this comes at a price. Keeping in mind that we do not pay the full price, I checked out some availability and some prices through the listing. I checked out some weekday nights throughout the summer and it looks like this rental will cost you about $750-$850 a night. That's a lot of dough! However, do keep in mind that truly three families can accommodate this house at one time, so splitting evenly, the price does become more manageable. 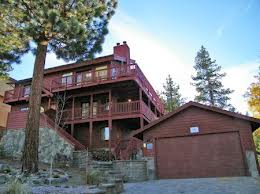 There are many rental agencies that can help you to find your dream vacation rental, but this property is listed through Lake Tahoe Accomodations, property ID 1649 (the above heading is a link!) LTA is open for reservations 24 hours a day at 1-800-250-8033. Well, no matter the weather, you've gotta eat, right? We are very meticulous about saving money when we come to Lake Tahoe by preparing our own food at our house, but when in South Lake Tahoe, we never fail to stop at the Red Hut Café (www.redhutcafe.com), located at 2497 Lake Tahoe Blvd. The Red Hut Café, less formally known as the Red Hut, is a small, "family-run," diner type restaurant that likely seats no more than 30 in the diner and another 12 at the counter. Hours at this location are from 6am to 2 pm daily. Both the breakfast and the lunch menus are served from opening to close. The menu boasts a wide variety of the usual breakfast items, omelettes, eggs, hash browns, and pancakes and waffles often covered with fresh fruit in season and whipped cream. When eating at the Red Hut, it is hard to resist "The Usual," two eggs, hash browns, and a biscuit drowning in decadent gravy, all for about $5.99. Most breakfast items are between six and ten dollars. Nothing quite like "The Usual!" The Red Hut has been in operation since 1959, when the Old Donut Shop building at Stateline was moved 2.3 miles down the road to it's current location and was marked with the same sign that stands today. Two more locations have since opened in the South Lake Tahoe Area, one on Kingsbury Grade and the other at Ski Run Blvd. More recently, Carson City and Reno Locations have opened. Check out the website for exact addresses and hours. Hate to give away this secret but if you don't get there early, expect LONG waits, especially on the weekends. This is a popular place! We make it our rule to never be there later than 8:30am, and that's on a weekday! No one in this family needs to be persuaded to come here! with the one below. My son must be like three. One of my favorite Red Hut pictures! Share the Red Hut with your friends! The weather isn't going to stop this active GoFamily!! Get your rain jacket, some decent shoes, and an umbrella and go for a walk anyway! We took a short drive to the Taylor Creek Visitor Center where we enjoyed the half-mile long Rainbow Trail...3 times. The trail is flat and paved and features interpretive information along the path about the lake and its surrounding ecosystem. There is also an underground creek exhibit which is rather uninteresting but worth a quick look. Anyway, we were out for the exercise, so we just really hoofed it, so doing it three times took us about 20 minutes. Umbrellas and raingear and you are good to go!! 2. Visit an arcade. Really the only arcade we found in the Tahoe area was an arcade at the Horizon hotel at Stateline (www.horizoncasino.com/arcadeworld.php) . Now I would normally advise that arcades are not an effective use of money, but a game of air hockey costs 50 cents and can last a good while. If you stay away from the Skeeball, and the Chuck E. Cheese mentality of trying to accumulate tickets so you can trade them in for garbage (for want of a much more descriptive word), you can enjoy some fun for an hour or so and not go broke or go home with plastic spider rings or sticky hands. 3. Go see a movie. We never go to the movies--what a rip off--but heck, you're on vacation and it's raining, so whaddayagonnado? The Heavenly Village Cinemas (www.heavenlycinema.com) are located at 1021 Heavenly Village Way, phone (530)544-1110. There are 8 cinemas, with matinee prices until six pm on all shows, which still left us paying for $8 tickets. Hmm...wonder how much five tickets cost after six? Add the popcorn and you should have just sprung for a new flat screen TV. Well, thank Heaven! We woke up on the morning of Wednesday, June 26th and the weather was amazing. Stay tuned for another post describing how to cram four days of a Tahoe vacation into two!